SHORT OF TIME?? - DO IT ON LINE!! As always PADI are at the cutting edge of technology for diver training, and on-line training is now available. If you are looking for a flexible way to fit a scuba certification into your busy schedule, or if you just prefer web based learning, then PADI’s online scuba courses are the way to go. With mobile broadband it means that you can start training immediately – anywhere you are! How good is that?! Whether you want to take scuba lessons for beginners or you’re ready to advance your scuba skills training, PADI eLearning with ourselves at the Old Harbour Dive Centre as your affiliated diver school is a convenient way to learn. 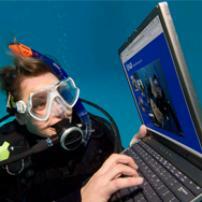 • Work at your own pace using the PADI eLearning system for your scuba knowledge development. released online courses – you are purchasing materials on line which are constantly being updated. ALSO………….If you are looking for a present and want to give the gift of scuba diving – then you can purchase for your friends and loved ones a eLearning Access Pass. The perfect gift for birthday, holidays and special occasions. • “Great,fast, got me ready for inwater training! • Amazing. Loved the flexibility of learning at my own pace. Great Videos. • Excellent material. Never thought it would be such a convenient way of learning. • Great! I am excited to continue to DiveMaster! • I am very pleased to have done this online…….I sometimes feel intimidated with the presence of others in a course……..This way I could answer the questions at my relaxed leisure. • Having this course available was a great help as I saved at least a day of holiday by doing it ahead of time. THANKS. • It was at my pace, concise, easy to understand, and I can’t wait until I move on to another level of advancement. I will certainly be using the PADI e-Learning system again. • This course was excellent, online support also very excellent!! I would strongly consider taking more PADI online courses in the future. Very user friendly. • This was a wonderful experience, I would definitely recommend it to anyone looking to learn to scuba dive. The course fee for PADI Scuba Tune-up Online is £35.00, non-refundable. The PADI Open Water Diver course is, by far, the world’s most popular scuba certification course. Millions of people have started diving as certified PADI Open Water Divers. Learning to scube dive requires both knowledge development (facts, principles, concepts) and motor procedures (skills,techniques,methods). The PADI Open Water Diver Course ONLINE provides the knowledge development portion you need. You develop the remaining skills by actually diving with a PADI Instructor at the dive centre or resort. The PADI Open Water Diver Course online is £80.00 non-refundable. The fee covers your knowledge development training and gives you unlimited access to an electronic version of the PADI Open Water Diver Manual (course textbook). Your PADI Dive Centre or Resort will charge an additional fee for the inwater portion of your certification. You will also need to purchase a mask, snorkel, pair of fins and other personal dive equipment. Your PADI Dive Centre will guide you through this process and may suggest additional equipment along with the required purchase of a Recreational Dive Planner (Table or eRDP version) and a log book. The online version of the PADI Advanced Open Water Course will include knowledge development for the two required topics – the Deep and Underwater Navigation Dives, along with five of the most popular elective dives. These include Night Diver, Peak Performance Buoyancy, Wreck Diver, Boat Diver and Underwater Naturalist. As with the PADI Open Water Diver course, the entire PADI Adventures in Diving manual will be available online to divers enrolled in the course. Experience real adventure and be one step closer to Master Scuba Diver – the ultimate non-professional certification in recreational diving. You must be a PADI Open Water Diver before participating in any inwater training. The PADI Advanced Open Water Course online is £80.00 non-refundable. The fee covers the knowledge development training as well as unlimited access to the entire PADI Adventures in Diving manual online. Your PADI Dive Centre will charge an additional fee for the inwater portion of your certification. You may want to purchase additional equipment through your PADI Dive Centre as well. After completing the online portion of the PADI Rescue Diver Course you'll visit your PADI Dive Center or Resort to complete your training. You'll take a short eLearning Quick Review to confirm your understanding of safety-related material from the course. Then, you'll complete the inwater training portion of the course. Your instructor may introduce you to ten rescue exercises in confined water and then have you practice them in open water. Finally, you participate in two Rescue Diver Scenarios in open water. Your PADI Dive Center or Resort will charge a separate fee for completing your rescue training exercises and scenarios. The course fee for PADI Rescue Diver Course Online is £80.00, non-refundable. The course is designed for anyone who wants to improve their dive theory knowledge. PADI Divemaster candidates, IDC-bound Pros, IDC Staff Instructor candidates and Course Director Training Course applicants can also use the program to prepare for their course exams. The course fee for PADI Dive Theory Online is £65.00, nonrefundable. The PADI Digital Underwater Photographer Course Online includes all the knowledge development requirements for the course. If you want to take digital photos and video near, around or underwater this course will teach you how. In the first two sections, the focus is primarily on still photography � whether you take digital still images with a camera or camcorder. Finally, Section Three covers some specific tips on how to image quality underwater video with digital cameras. Unlike other PADI eLearning® system presents you with interactive presentations that include videos, audio, graphics and reading. Short quizzes let you gauge your progress, and review and correct anything you might happen to miss. This lets you move through the program efficiently and at your own pace. What else is required to complete the course? Prior to certification as a PADI Digital Underwater Photographer Level One, you must complete a training dive in a pool, confined water or open water with a PADI Digital Underwater Photographer Specialty Instructor. The Level One certification is open to snorkelers and the certification card issued for that level will state that it is a non-diving certification level. For divers in training or divers that are already certified, certification as a PADI Digital Underwater Photographer Level Two requires you to complete a second open water training dive. Contact your PADI Dive Center or Resort to schedule these sessions. The PADI Digital Underwater Photographer Course Online is £80.00, nonrefundable. Your PADI Dive Center or Resort will charge an additional fee for participation in the training dives. Contact your PADI Dive Center or Resort regarding these additional costs. Prior to certification as a PADI Enriched Air Diver, you must complete a Practical Application session and either two enriched air training dives or predive simulations, with a PADI Enriched Air Specialty Instructor. Contact your PADI Dive Center or Resort to schedule these sessions. The PADI Enriched Air Diver course online is £125.00, nonrefundable. The fee covers the knowledge development training as well as unlimited access to the PADI Enriched Air Diver Manual online. Your PADI Dive Center or Resort will charge an additional fee for participation in the Practical Application session and enriched air training dives, or predive simulations. Contact your PADI Dive Center regarding these additional costs. 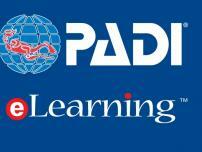 The PADI Instructor Development Course online is £205.00 nonrefundable. The fee covers nine separate topics online to prepare you for the practical sessions needed to complete your Assistant Instructor course or Open Water Scuba Instructor course. The two programs combined is the full IDC. After completion of the OWSI course or full IDC, you must successfully complete a PADI Instructor Examination (IE) and also be a CPR & first aid instructor before certification as an Open Water Scuba Instructor. Your PADI Career Development Center, 5 Star Instructor Development Center or authorized Course Director or IDC Staff Instructor will charge an additional fee for the practical sessions of your training. There is an Assistant Instructor application fee or an IDC registration fee and IE fee that must be paid to PADI for processing. You will also need to purchase an IDC Crew-Pak and have a current PADI Instructor Manual depending on how recently you may have completed your PADI Divemaster course. There are also other required materials and personal dive equipment that you may already have. Your Course Director or IDC Staff Instructor will guide you through this process and may suggest additional materials or dive equipment that are necessary or need to be upgraded.